Members of the MCC Chorus (MUS 100 – 001) experience musical growth through singing a diverse selection from the finest music written for chorus. The repertoire includes great choral classics, newly-written works and choral settings of folk songs, spirituals, show tunes and popular music. There are frequent opportunities to feature soloists from the chorus. Chorus rehearses on Mondays and Wednesdays, 11:30 a.m. to 12:20 p.m. in B257. The chorus performs a concert each semester and sings for special events on campus such as the Veteran’s Day Ceremony in November, Fall Commencement and Spring Commencement. In December, the chorus also participates with Voices In Harmony (a local community choir) in an annual presentation of Handel’s Messiah, performed as an audience sing-along with orchestra. 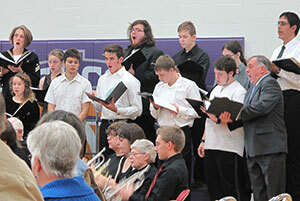 MCC participates in the Annual 2-Year College Choral Festival each April. At this festival, MCC joins other community college choirs for an exciting day of listening and performing. MCC students who can't participate in the day chorus can participate as a member of Voices In Harmony for college credit (MUS 100). VIH rehearses off-campus at Bethany Lutheran Church, 76 W Crystal Lake Avenue, Crystal Lake, on Mondays, 7:30 to 9:30 p.m. Students in this section are expected to fully participate in the concerts and activities of the community choir. The MCC Chamber Choir (MUS 161) is a small, a cappella ensemble of 12 to 16 experienced singers looking for a challenging musical experience. To register for this ensemble, you must audition and have the permission of the instructor. The Chamber Choir will sing a variety of music, including madrigals through today’s contemporary a cappella sounds. If you love singing and choral music, you’ll love the MCC Chamber Choir. The Chamber Choir will rehearse on Wednesdays, 10 to 11 a.m. 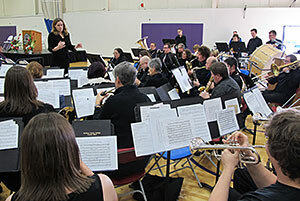 The Concert Band at MCC performs a variety of music from the wind band repertory; from classics to modern masterpieces. This forty-member group welcomes MCC students as well as community members, and can be taken for credit (MUS 162). The band performs four or five times per year in the MCC Conference Center, at college functions, and in the community. Additional performance opportunities are available through MCC’s chamber ensembles, jazz band, and private instruction.